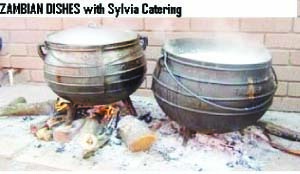 Times of Zambia in conjunction with Sylvia Banda and her husband Hector, the proprietors of Sylvia Professional Catering Services Limited will be running a Zambian dish from the Zambian Cookbook, published by the couple every week on this column. We will share the views of the Banda’s that food has a strong cultural, historical and socio-economical relevance especially to Zambians in the Diaspora who would like to taste the foods they were raised on. So let’s cook on with a recipe from the Zambian Cookbook. vegetables and cook until tender. SERVE HOT WITH BOILED FRESH CASSAVA OR FRESH SWEET POTATOES.